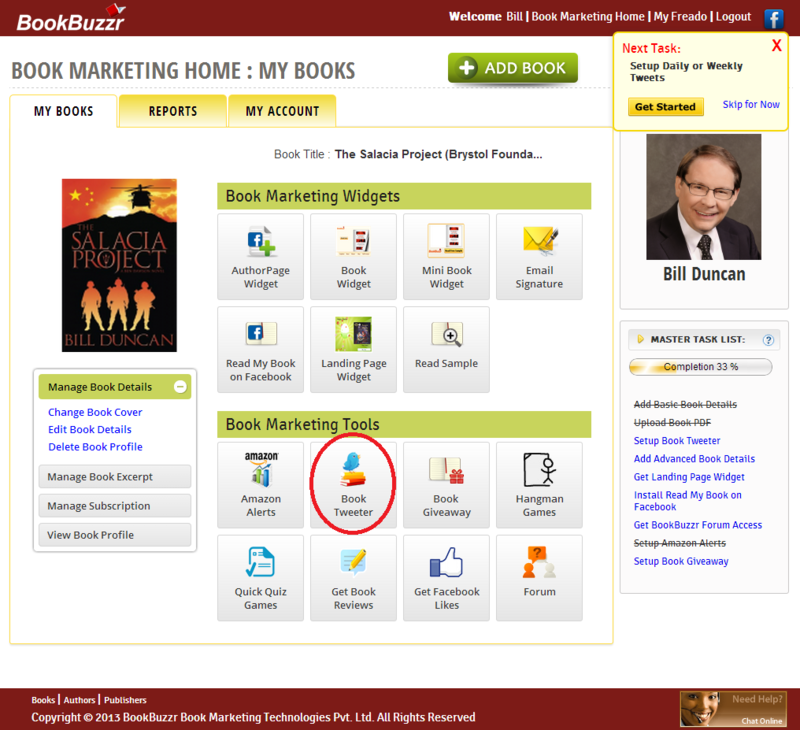 If you are a new or existing author on BookBuzzr, this instruction guide should help you add in your Twitter details and start marketing your book on Twitter. This article assumes that you already have an account on Twitter. 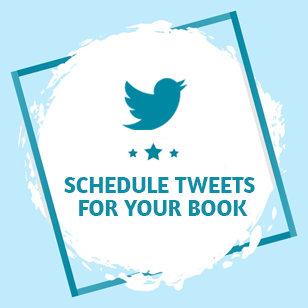 Note: Before you set up BookBuzzr to automatically tweet about your book, please read this guide about how to use Twitter effectively to market your book. 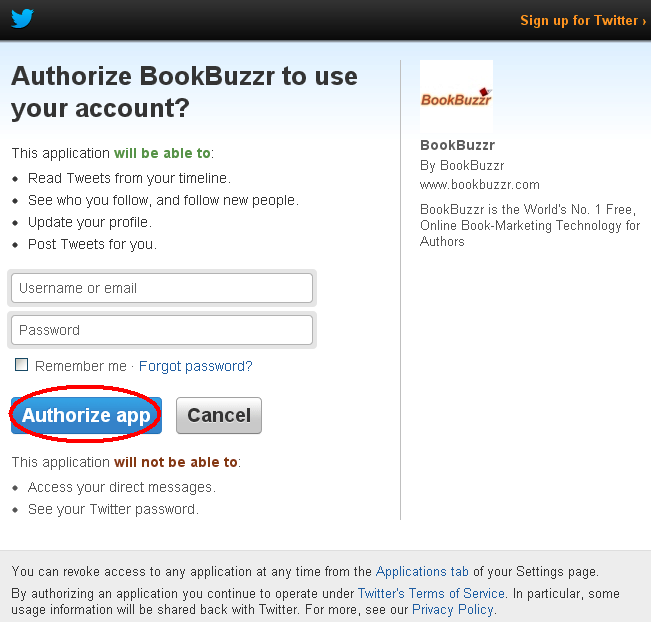 Too often, we find authors simply setting up the book-tweeting feature on BookBuzzr and doing nothing else. So you find an author’s twitter stream containing nothing but promotional messages sent automatically from Book Tweeter. While this is acceptable during short periods (for example, when you are on a short vacation), it is not okay to simply send out only marketing style messages to your followers. Do not post duplicate updates to your account. Repeatedly posting the same message is considered spam. To decide how often to post a message during the day, just ask yourself how often would you want to see something similar from others. Do not cross-post the same message from multiple accounts. It makes you look less original and clogs up peoples streams. Avoid sending too many tweets in quick succession, it tends to look like spam. 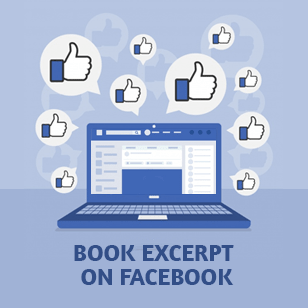 Involve your followers and fans in promoting your book. If your book has been tweeted by a fan make sure to drop a thank you and also engage them in a conversation. 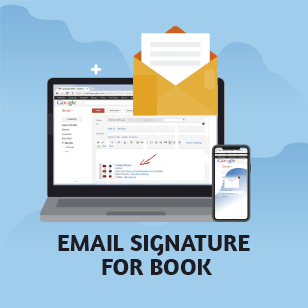 One way to engage with your readers without spamming them is to go through your book and pull out various messages or quotes with each consisting of 140 characters or less. Once you have assembled enough of these quotes BookBuzzr will help you automatically send out these quotes or messages. 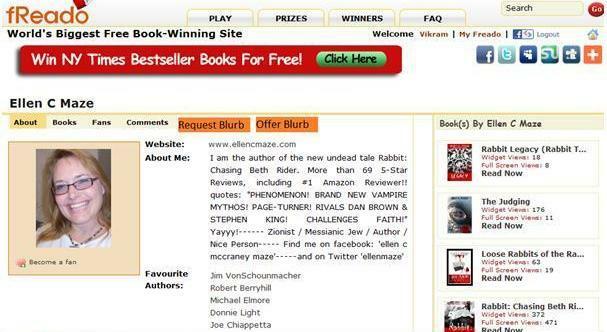 Login to BookBuzzr. 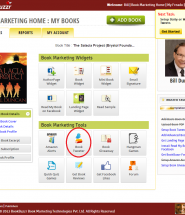 You will be redirected to the “Book Marketing Home” page. 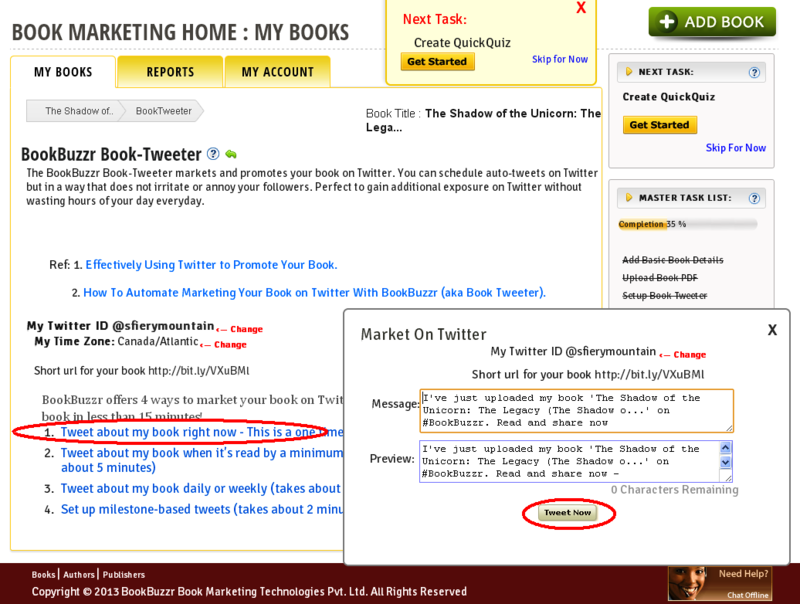 Click on “Book Tweeter” option under ‘Book Marketing Tools’ Section. You will then be asked to setup your time zone. 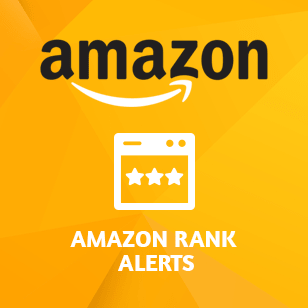 This is required because BookBuzzr’s Book Tweeter sends out messages at predefined times. Please click on “Set Your Time Zone Now” Choose your time zone and then click on ‘Next’. Now click on “Tweet about my book right now” in the Book Tweeter page, this is a one time tweet that tells your Twitter followers that you’ve uploaded your book to BookBuzzr. Feel free to change the default messages. Be creative! 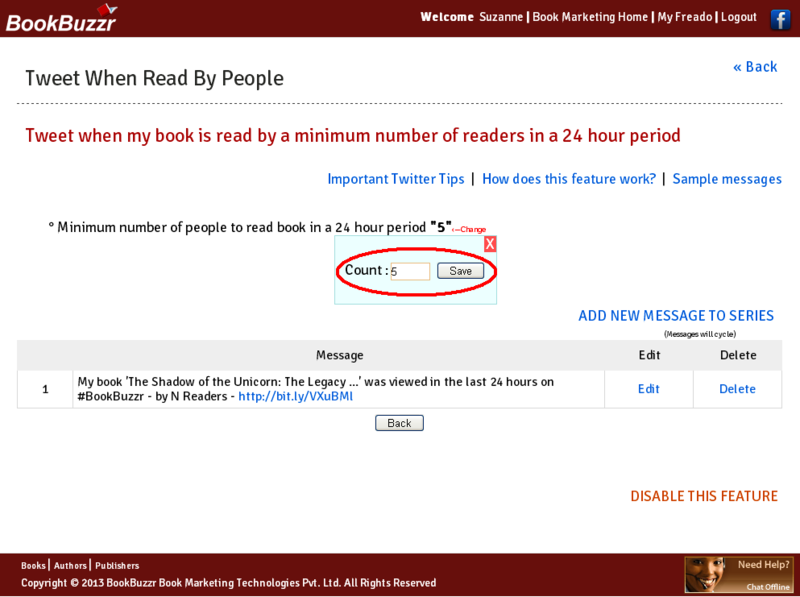 Now click on “Tweet about my book when it is read by a minimum number of readers during a 24-hour period.” For example, if you say that you want a tweet to go out to your followers every time a minimum of 10 people read your book in a 24 hour period, Book Tweeter will send out a tweet if this threshold is met. 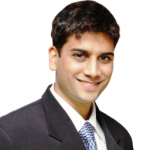 You can add a number of ‘default’ messages that are used in a cyclical manner. So please be creative and add a number of messages to avoid repeating yourself in your Twitter stream. Now click on the “Back” button. 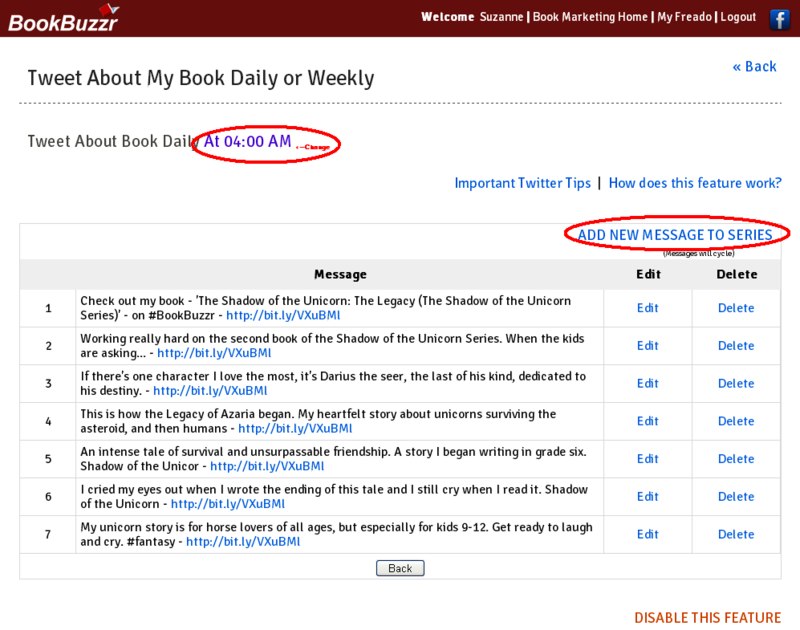 With this twitter feature you can set up BookBuzzr to send out recurring daily or weekly tweets related to your books. Very Important – Set up a minimum of 7 messages if you choose the “Daily” option and 2 or 3 messages if you choose the “Weekly” option so that your followers don’t feel like you are spamming them. These messages could be quotes from your book, important ideas from your book, or something else that adds value to your followers. 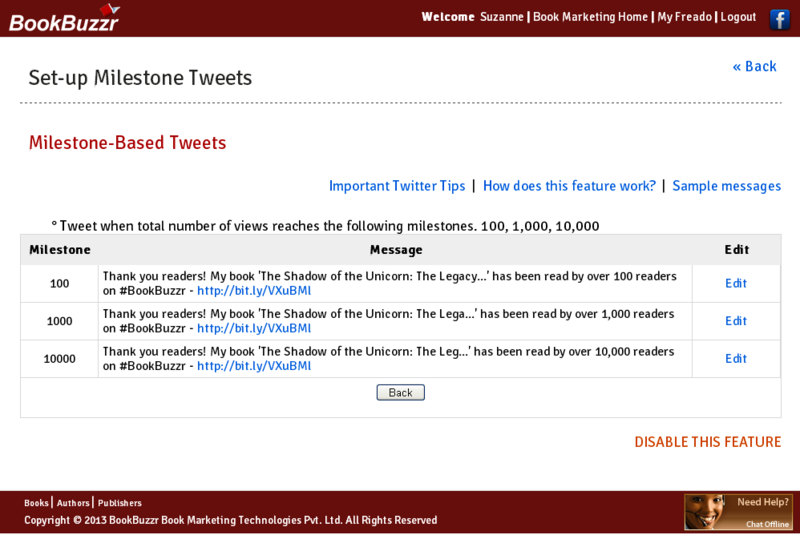 Finally, you can set up “Milestone based tweets” This feature causes BookBuzzr to send out tweets to your followers every time an important milestone (in terms of number of people reading your book-sample) is reached for your book. Think of this as a little Twitter celebration when the reader count for your book reaches 100, 1,000 and 10,000. That’s it. Now you can take a long holiday and sip a long cool drink on a tropical island while Book Tweeter promotes your book on Twitter for you! But be sure to check in at least a few times a day and provide your followers with some amusement, education or information! I’m learning more about Twitter everyday. Thank you! Another great tip. Now if I could only remember my password to BookBuzzr. Thanks. Have you tried using the “Forgot Password” feature? At any rate, we’ll be in touch to help you out. A great gift to dedicate to the entire family for years of reading enjoyment and fun.